Just back from visiting my mother in Lebanon and because I hadn’t been for nearly two years, it was a rather nostalgic visit. I did things that I used to do when I lived there like going to the bakery to make manaqish for breakfast. 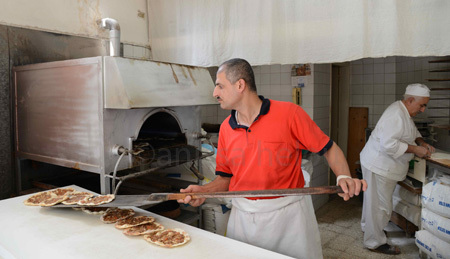 It wasn’t any of the bakeries of my youth in west Beirut because my mother now lives in Balluneh in the mountains but I love Emile, her new baker, just as much as I loved our bakers in Hamra even if Emile doesn’t use firewood. 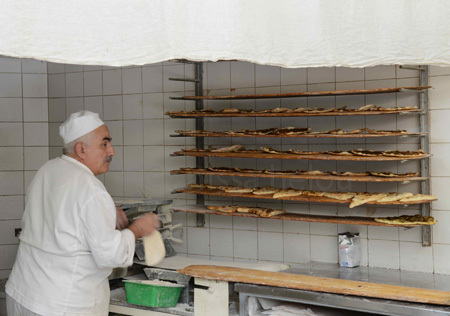 His dough is wonderful though and people bring their own topping or filling (a very common practice in Lebanon) for him and his worker to shape and bake manaqish, fatayer and lahm bil-ajine. I wanted to have both za’tar and kishk manaqish, so, my mother prepared both toppings the night before, put each in a tupperware and the next morning, after we had our Turkish coffee and freshly pressed orange juice, we carried our toppings and walked over to old Emile’s bakery where they were busy baking a large order of lahm bil-ajine. This meant we had to wait our turn which was just as well — the battery on my camera had run out and I had to walk back home to get my spare one. By the time I got back, they’d already made our manaqish and I insisted on having one there, piping hot straight out of the oven while watching the procession of customers, a mixture of well-heeled ladies and migrant workers with lovely Emile treating them all with the same grace. After I ate my manqûsheh, we went back home for my mother to make me another one but this time as a wrap filled with labneh, olives, fresh mint leaves & tomatoes. Unfortunately my mother had left the heirloom tomato ripen a little too much and I had her use the cherry ones which were firmer although not so tasty. She first spread the labneh along the middle, then pitted the olives and lined them over the labneh — I love watching my mother ignore all the gadgets I buy her like an olive pitter to still use her beautiful hands and work the way she has always worked from she was a young girl helping her mother. 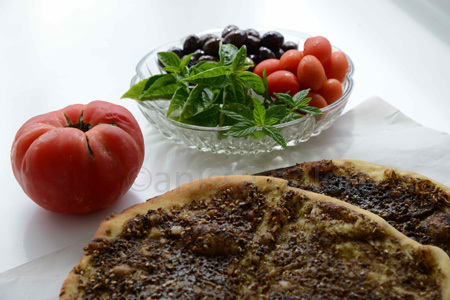 She then arranged the mint leaves and tomatoes over the labneh and olives. I sprinkled a little salt over the tomatoes and drizzled a little more olive oil before letting my mother fold the manqûsheh into a ‘aruss (meaning bride in Arabic but describing a wrap). By then, the bread had cooled so she put it into her SEB to both heat and crisp it up a little. A cracking breakfast which I should make in London but I doubt any bakery will oblige. Perhaps my Turkish saj borek maker will! Dissolve the yeast in 1/4 cup tepid water. Stir until creamy. Mix the flour and salt in a large mixing bowl. Make a well in the center. Add the oil to the well and, using the tips of your fingers, rub the oil into the flour until well incorporated. Sprinkle your work surface with flour. Remove the dough onto it and sprinkle with a little more flour. Knead for 2-3 minutes, sprinkling with more flour if the dough sticks. Invert the bowl over the dough and let rest for 15 minutes. Knead for a few more minutes, or until the dough is smooth and elastic and rather soft. Shape the dough into a ball and place in an oiled bowl, turning it to coat all over with oil. Cover with plastic wrap. Let rise in a warm, draft-free place for 2 hours. Fold after the first hour. Divide the dough into 6 equal pieces, each weighing about 5 ounces. Shape each into a ball. Cover with a wet, although not dripping kitchen towel. Return to rise for 30-45 minutes. Mix the ingredients for the topping well. Flatten one ball of dough with your hands until you have a 7-8 inch disk. Transfer the disk of dough to a large non-stick baking sheet (or one lined with parchment paper or a silicone pastry mat). Raise the edges of the disk by pressing on the dough with the tips of your fingers about ½ inch inside the edge. Then, make dimples all over. Spread 1/6th of the topping all over the dough, inside the raised edges. 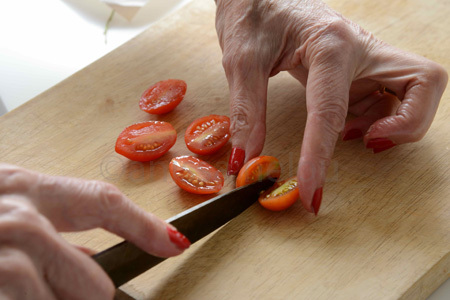 Brush the edges with a little olive oil. Make the rest of the breads in the same way. Let rest for 15-20 minutes. Bake the breads in the preheated oven for 12-14 minutes. Serve immediately or let cool on a wire rack to serve warm. You can freeze these breads to serve later. Simply put them frozen in the oven. 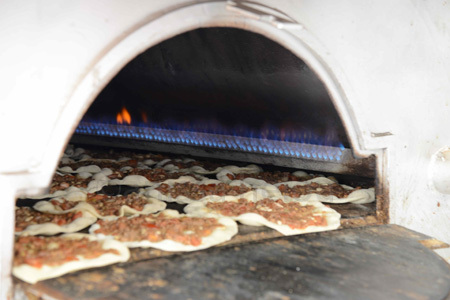 Turn the heat to 350 degrees and heat for 10-15 minutes, or until they are completely thawed and hot. great post///the aromas wafting from the bakery must be divine..whats is a seb? Your last travel to Lebanon (return to basics !) reminds me this excellent report, which I like very much and who restores, with happiness, I find, some aspects of the joyful life of the Lebanese with a big place dedicated to the Lebanese Cuisine. It is so amazing to see the Sunday meal in the mountains with all these specialities… Wow! Now I want to meet your mother!!! I nearly drooled for the manaqeesh!! oh, you’ll love my mother. she’s as good a cook as your mother, and just as nice. we should make it happen one day. in fact, you may get to meet her before you see me again if she goes to visit my brother in dubai 🙂 i’ll put you two in touch.